Email Marketing is nothing short of a war. Is this an exaggeration? NO! 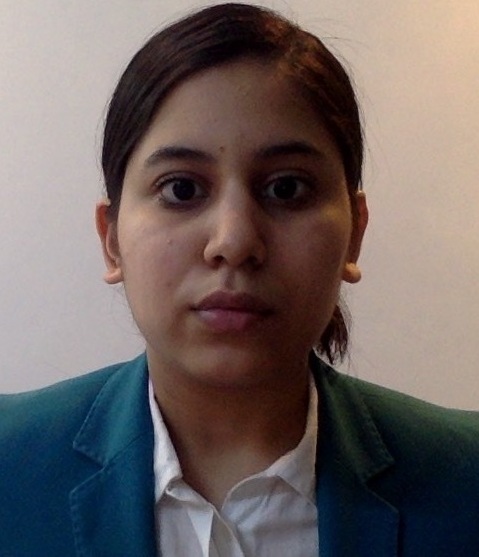 I hope you know that your prospects are probably getting hundreds of other emails similar to the one you just sent. Thus, while there are no real arsenals involved, you still have to fight your way to grab the eyeballs of your prospects. The email marketing arena is congested, not to say extremely noisy where thousands of others like you are queuing up to get noticed. Now, this is not to say that email marketing is ineffective. In fact, in a showdown with other forms of marketing processes, email marketing emerges as a veritable warrior. However, I will have you know that email marketing is not going anywhere…for a long, long time. Needless to say, email marketing is still one of the best ways to market your product. Econsultancy’s Email Marketing Census confirms this. They surveyed over three-quarters of 689 company respondents to get some amazing revelations. So don’t give up on email marketing before you know its full potential. And we have 12 more important email marketing stats to prove this. While click-through-rate & open rate constitutes perfect metrics, but it still gives a pretty clear picture. GetResponse recently ran an email marketing benchmark report to assess what sort of email campaigns perform the best when it comes to click-through rate and open rate. 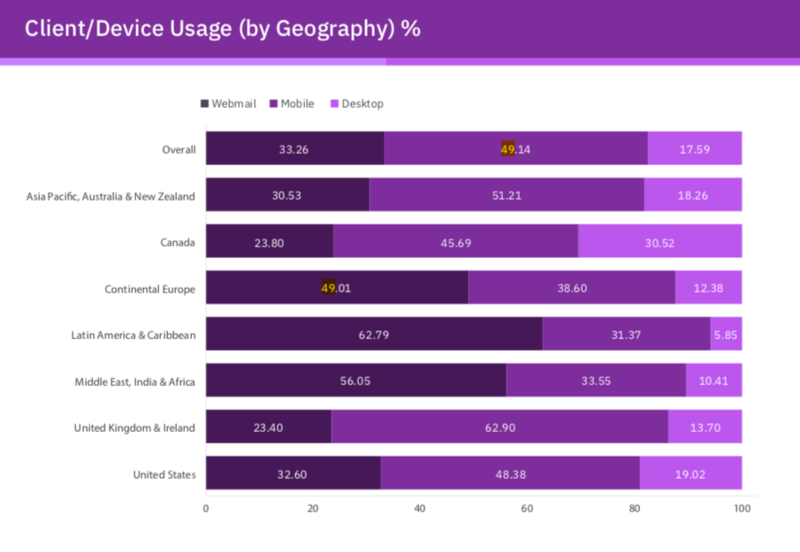 They analyzed over 4 billion emails…yes 4 BILLION…from July to December 2018, in 126 countries across 19 industries. And they found out that welcome emails, in general, have a high open rate. Welcome emails sent to newly subscribed clients show a great performance with 84.22% open rate and 22.91% click-through rate. Apart from this, personalized subject lines can also help you skyrocket your open rate. According to a research report, Emails with personalized subject lines generate 50% higher open rates as compared to regular subject lines. So, don’t forget to welcome your new customers and do some extra efforts to personalize your emails if you want to get maximum open and click-through rates. Does the prospect of getting things done automatically without much hassle, and getting better returns seem exciting to you? Then you are going to love automation in email marketing. From sending out targeted triggered emails to managing your email list, email marketing automation has you covered from all aspects. As revealed in a survey report, about 64% of businesses use email marketing automation to schedule their welcoming messages and for other customer Onboarding purposes. And, it seems, that email marketing automation actually bears fruits…a whole lot of them. 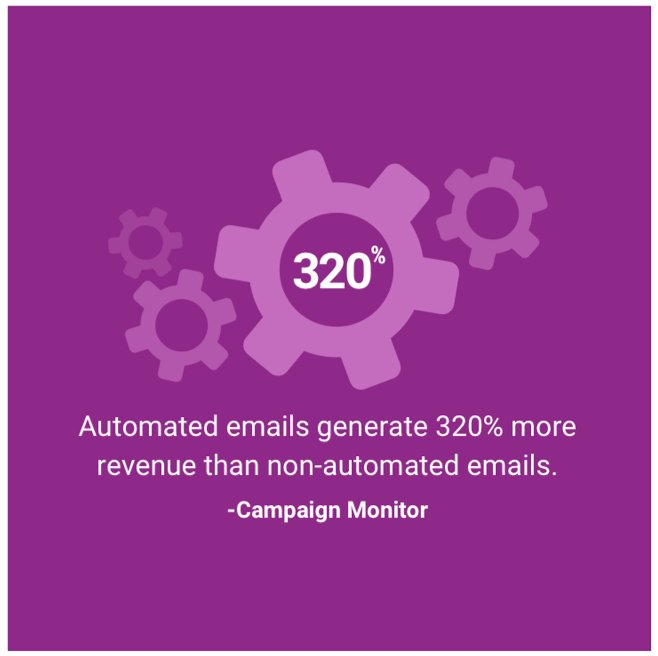 As per the Campaign Monitor’s survey report, automated emails generate 320% more revenue than non-automated emails. So don’t delegate anymore — automate your email marketing process without further delay. Retaining existing customers and converting present leads is even more important than generating new leads. This is where email marketing hits the sweet spot. Over 80 percent of professional marketers and sales experts claim that email marketing is the best channel to boost customer acquisition and retention. 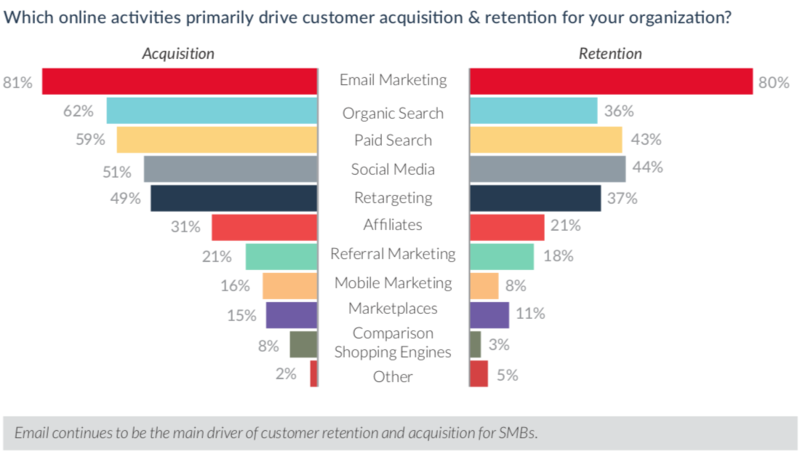 Now this much is clear — if you want a better retention rate, then the best way to go about it is by riding the coattails of email marketing. The verdict is in. Given that the email marketing is great when it comes to things like click-through rate, open rate, and so forth, there’s no wonder that it delivers a strong Return on Investment (ROI) as well. Having a well-thought-out plan can help you boost your revenue tremendously. According to a report by DMA organization, when it comes to email marketing, for every $1 you spend, you are likely to get an average return of $32. Depending upon how credibly you devise your email marketing strategy, you will get equally wonderful returns — the stats prove it veritably. A visitor enters your e-store. Browse around a bit. Add a couple of things to his/her cart…you are about to make a great sale. But, wait. The customer suddenly made a volte-face. Alas! You were this close to making another sale. However, you still have a chance to bring that prospect back by compelling them to make the final purchase by sending out cart abandonment emails. 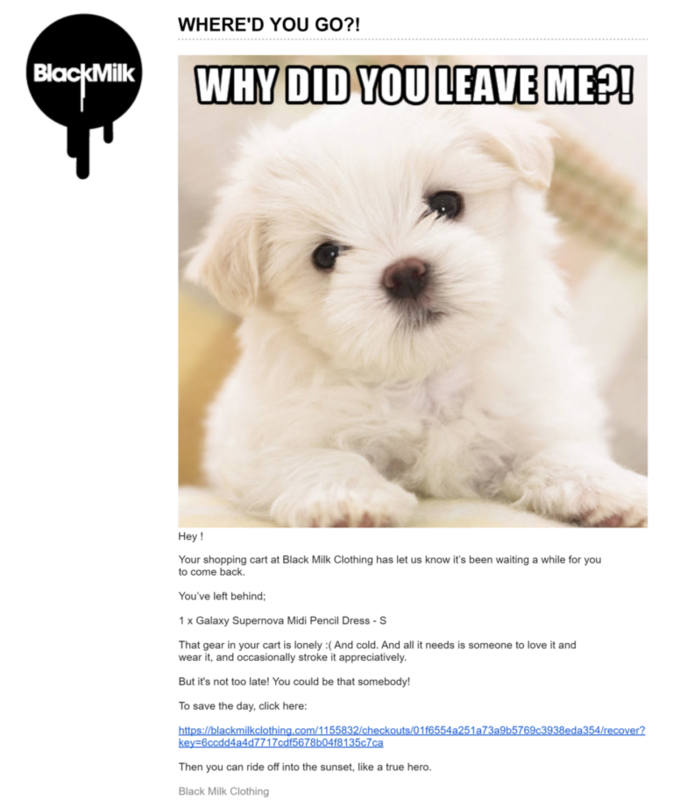 Black Milk Clothing send out one of the best cart abandonment emails. And such type follow-up emails work quite well. Looking at the email marketing stats by Omnisend, it is clear that sending out follow-up emails after a prospect abandons your cart results in 69% more orders than a single email. Times have changed, but have you changed your email marketing strategy? Or are you still sending out those stuffy textual newsletters that no one reads anymore…not that they did in the past. Today, customers are looking for something more creative and interactive. Reports have already claimed that you can increase your click-through rates by 300% if you add videos to your email marketing campaigns. Apart from videos, other forms of visual content including GIFs, interactive images, slider and more work too. And while you are at it, don’t forget to optimize your emails for mobile devices. If you think that you can get away with not optimizing your emails for mobile devices, then you are heading for a disaster. A big one at that! It is impossible for you to get agreeable results if you completely neglect your mobile audience. And I hope you know that a vast majority of audience opens up their email on their smartphones. According to a 2018 report by IBM, over 49% of all emails are opened on mobile devices. So, if you are looking to reach out to your complete audience base, then you simply can’t afford to overlook the audience that primarily uses mobile phones to check their emails. These stats are especially an eye-opener to all the detractors of email marking. Contrary to popular belief, email marketing is still way ahead of social media marketing — even Facebook doesn’t stand close. While Facebook is used by 2.23 Billion people, Email users go way past 3.8 Billion. As compared to 710 social sharing actions per day, over 281 Billion emails are sent in a day. This one is even more remarkable. Facebook’s organic reach is as low as 2%. On the other hand, the email delivery rate of email is over 85% —and it shows no sign of abating. Up to 20% of prospects made a purchase after seeing a Facebook ad. However, over a whopping 66% of consumers made a purchase as a result of email marketing. 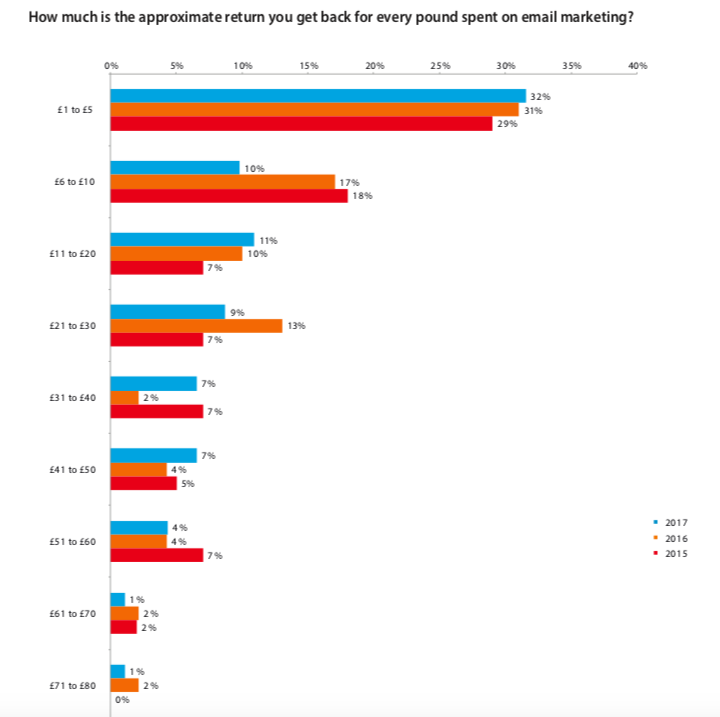 So which form of marketing yields the greatest returns on investment? Yeah, that would be email, hands down! You must be wondering why there’s an emoji in place of social media ROI? Well, there’s still no way to specifically track down the ROI for social media. Never mind, it won’t be able to beat email marketing either way. Whether it is the younger demographic you are targeting or a considerably older set of audience, you can’t go wrong with email marketing. In fact, over 73 percent of millennials prefer to use emails to get in touch with businesses. CampaignMonitor also gave a perfect breakdown of how customers prefer emails across different verticals and industries. For instance, over 66 percent consumers in general prefer communications from retail businesses to come via email. One would think that millennials would prefer social media marketing over emails. However, as you can discern, the reality is totally different. Statistics prove that even millennials are more inclined towards email marketing than any other form of marketing. 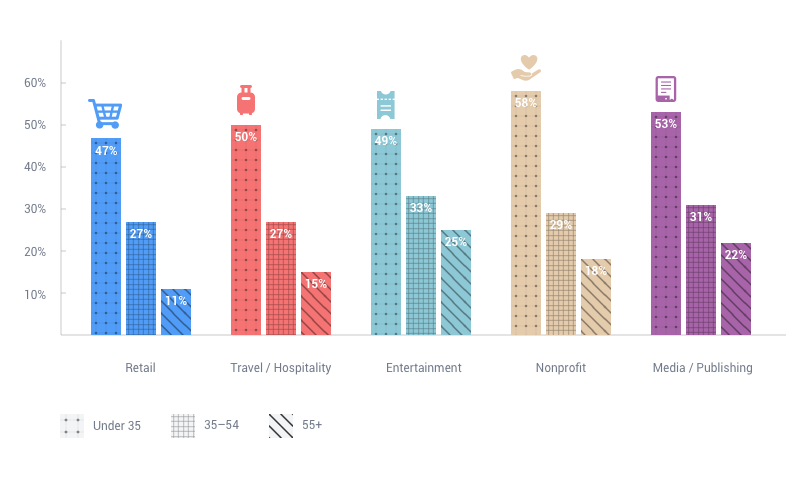 Whether it is B2C or B2B, email marketing is a hit among general demographic — that we have witnessed by now. However, it is still worthy to give these B2B email marketing stats a quick glance for they are utterly remarkable. 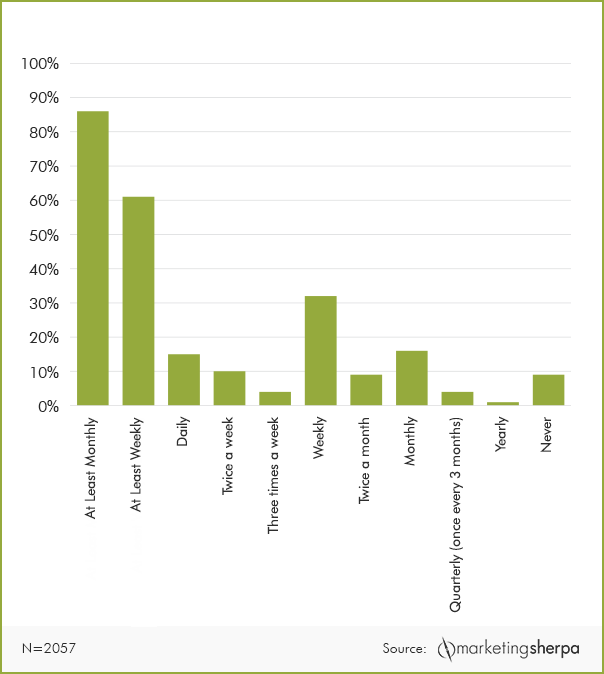 B2B audiences view email as an influential channel that can be used to draw useful information. 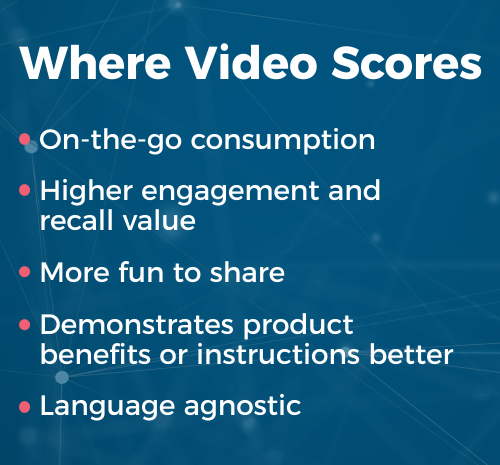 In fact, it is considered to be the third most influential channel after college recommendations and through leaders or industry-specific influencers. As per HubSpot’s report, 86% of business professionals would rather use emails to communicate for business purposes. 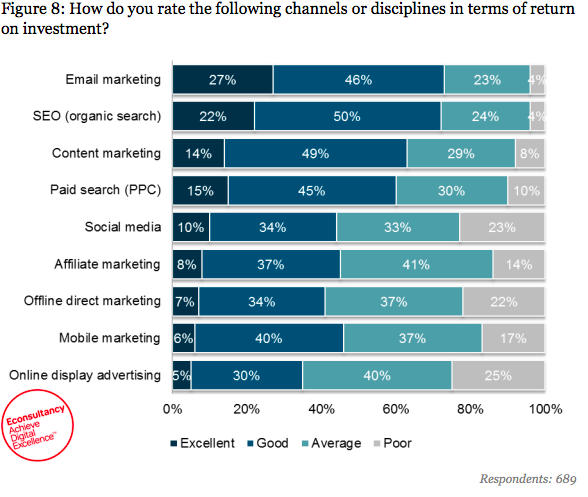 59% of B2B marketers consider email to be their most effective channel in terms of revenue generation. Juxtaposed to B2B email marketing campaigns, B2B email campaigns tend to generate higher click-through rates by over 47 percent. Now you are aware that if you are involved in B2B dealing and not using email marketing, then you are missing out on a lot of undiscovered opportunities and connections. I won’t deny — emails can be pretty annoying sometimes. Especially the ones that are filled with blobs of text with no clear goal or call-to-action. However, there is one type of email that everyone loves, and that is promotional emails. Don’t you get a glint in your eyes when you see an email with a “50 percent off” headline? There’s no need to be hesitant…you are not the only one. In fact, almost 90 percent of consumers say they want to receive promotional emails at least once in a month, with 61 percent of them willing to receive promotional emails weekly. Keep these email marketing stats in mind whenever you are having second thoughts about sending out promotional emails. 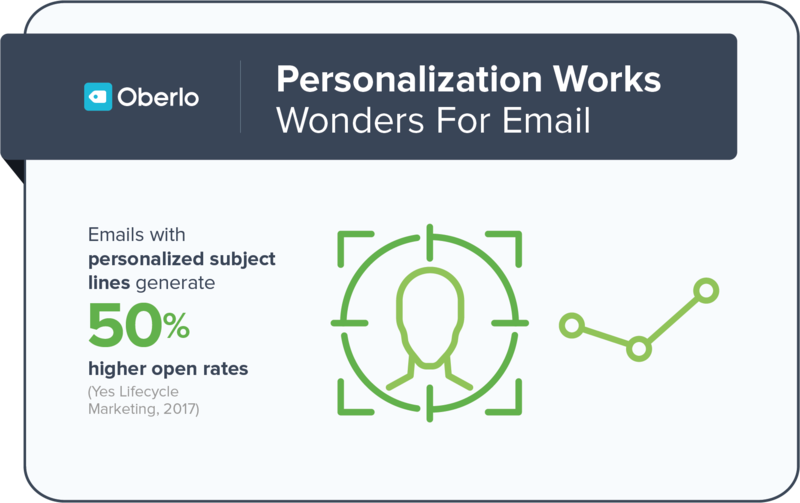 Consumers like all sorts of emails — from personalized emails to the promotional ones. However, what consumers simply abhor are the SPAMMY emails. It is these emails that give email marketing a bad name. Unfortunately, their number is quite high. 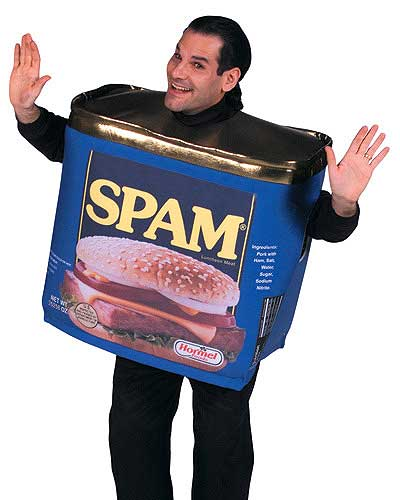 According to SpamLaws.com, about 45 percent of emails sent are actually spam emails. I know, it is sad that only 55 percent of emails include legitimate and valuable content. Over 14.5 Billion emails sent every day contain spam content. Advertising accounts for about 36 percent of spam emails. And to no one’s surprise, the return on investment rate for spam emails is abysmal. For every 12.5 million spam emails sent out, only one of the emails gets a response. This means that sending spams is pretty much useless. So might as well avoid sending them out. 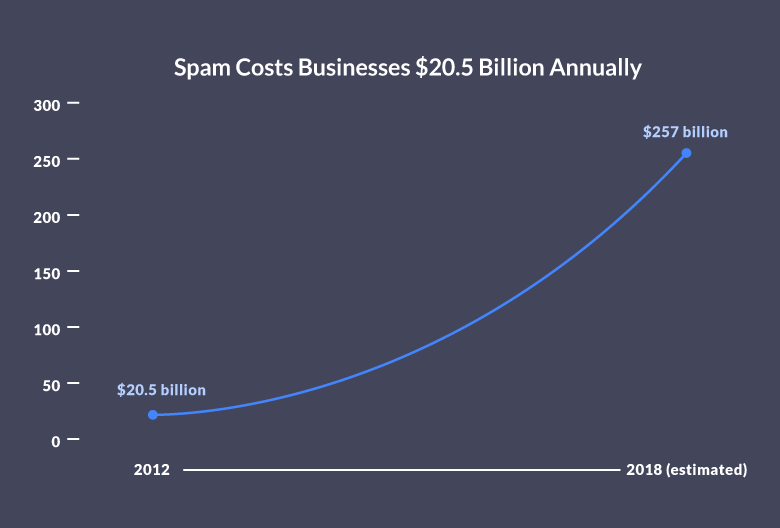 Moreover, businesses sending consistent spam emails are losing out on a lot of big bucks. A research report by the Radicati Research Group Inc. suggests that businesses lose over a whopping $20.5 billion every year due to spam emails. That’s a huge price to pay for something that isn’t even working out. 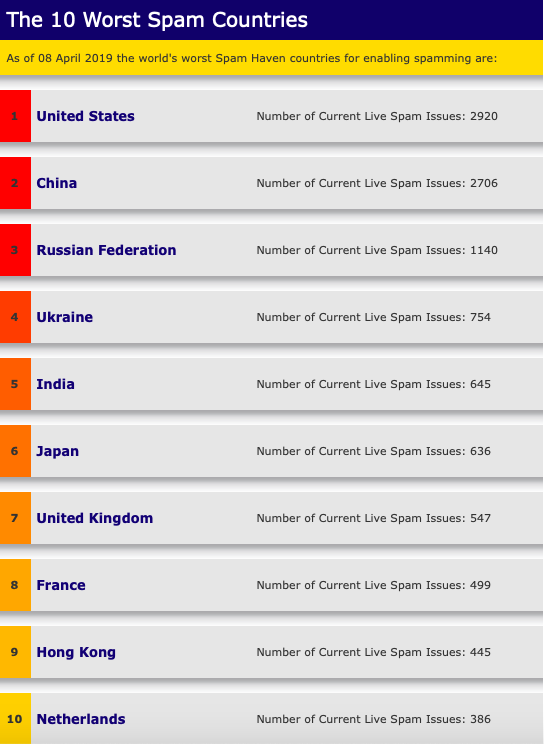 Are you curious to know which countries have the most live spam emails ongoing? 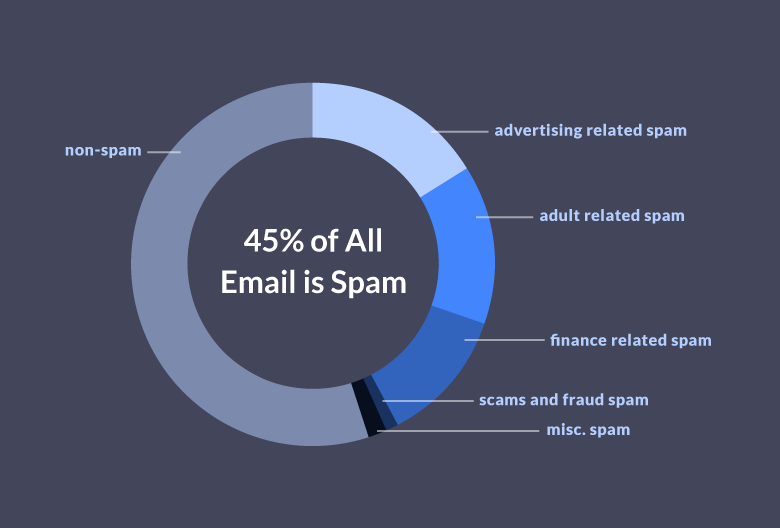 These email marketing spam statistics prove that it is better to avoid sending out something invaluable altogether. And it is not necessary that these businesses are intendedly sending out spam emails, sometimes even the emails that you consider legit can be treated as spam by internet robots. I can’t help but scoff at people who think that email marketing is doing to die sooner or later. If you were the part of the same I-hate-emails club, then I am sure you have changed your mind now. I’d say, better late than sorry. Now that you are reformed, let me end this email marketing stats directory on an even better note. 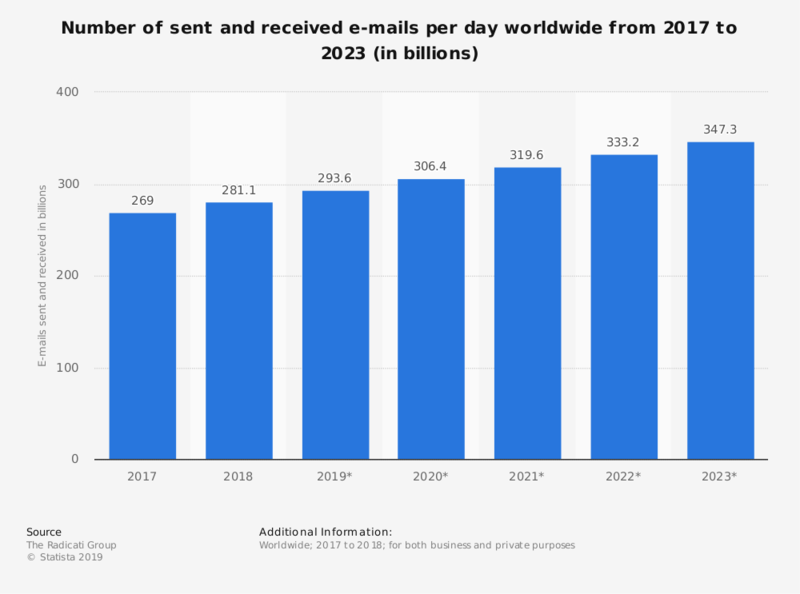 According to Statista, over 2.69 billion folks in the world used email in 2017 and the numbers have decidedly grown since then. Moreover, this number is set to grow to over 3.47 billion users by 2023. That’s almost half of the world’s population. Now, I hope we all agree that email marketing is an opportunity that one would be extremely dense to miss. If you are involved in a business of any sort, then you can’t do without using emails. And to see constant growth, you have to get used to email marketing, one way or the other. So, this is it. 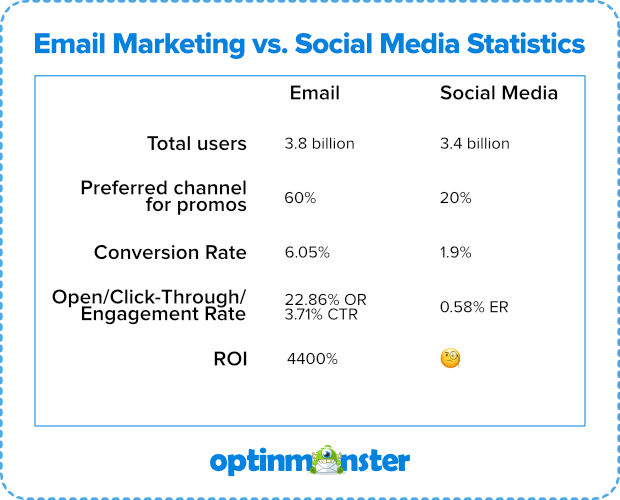 I hope you won’t take these email marketing stats as just numbers meant to be forgotten. We not only discussed the important email marketing stats but also talked a bit about the tips that can help you generate higher revenue with your email marketing campaign. For instance, as you can see that consumers are showing positive reception to personalized subject lines. Thus, take it as a nice tip that you can emulate while running your email marketing campaign. Also, please note that email marketing campaigns will only work in your favor if you have a clear goal in mind and if you are sending out something that adds some value to your consumers. 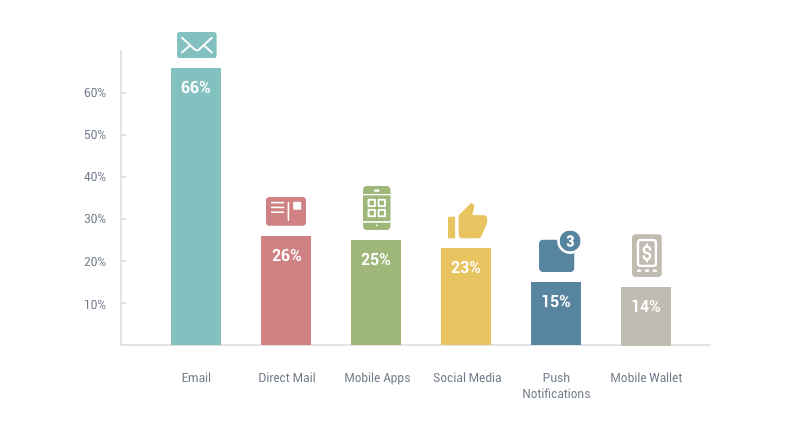 Do you think these email marketing stats are useful for your business growth? Is our list missing out on some important email marketing stats? Let us know in the comment section below!